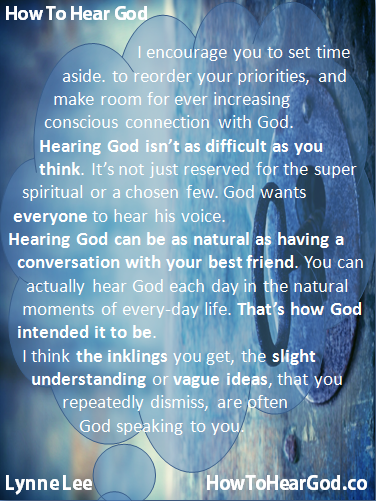 Hearing God isn’t as difficult as some of you think. It’s not just reserved for the super spiritual or a chosen few. God wants everyone to hear his voice. Hearing God can be as natural as having a conversation with your best friend. You can actually hear God each day in the natural moments of everyday life. That’s how God intended it to be. I think the inklings you get, the slight understanding or vague ideas, that you repeatedly dismiss, are often God speaking to you. God’s voice often sounds like one of your thoughts, like a spontaneous thought, a still small voice. Sometimes it’s audible, sometimes a picture in your mind’s eye, a feeling, an instinct, natural wisdom, or an impression about something. If you want to be able to more easily recognize God’s voice more of the time, this short coaching guide will help.